Its ravishing blossoms are a revelation for every gardener of which even the gardener’s grandchildren will still get to profit from. 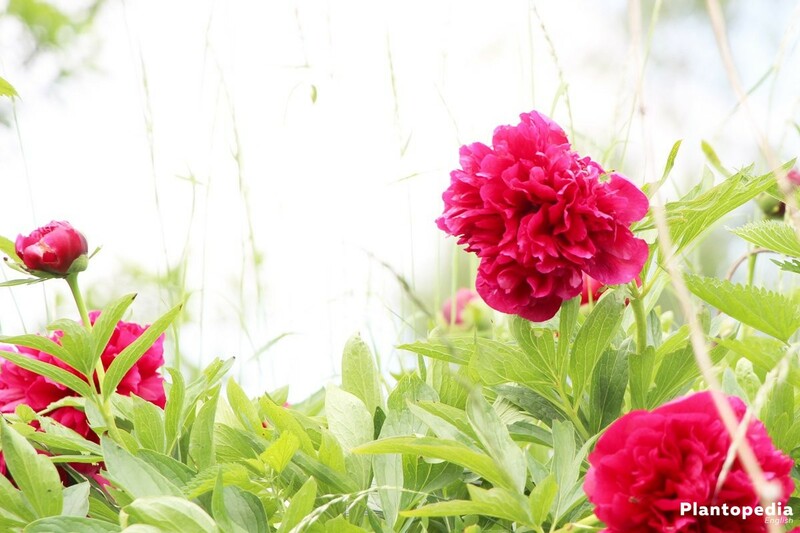 Peonies have been causing for decades now a constant wow-effect. 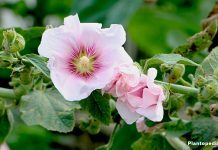 The romantic farmers’ garden plants simultaneously combine their unique full blossoms with robust longevity. They convince with these virtues as shrubs as well as bushy shrubs. 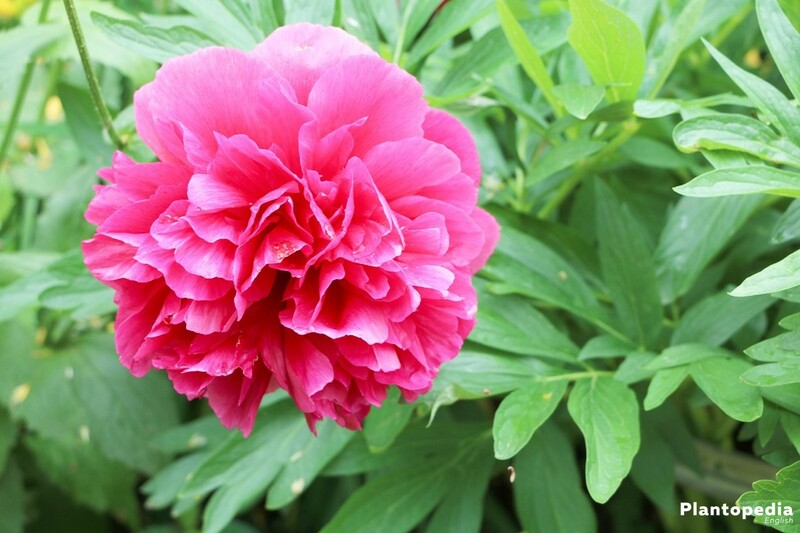 This instruction will explain to you in detail, how to properly plant, care for it and cut the Paeonia. 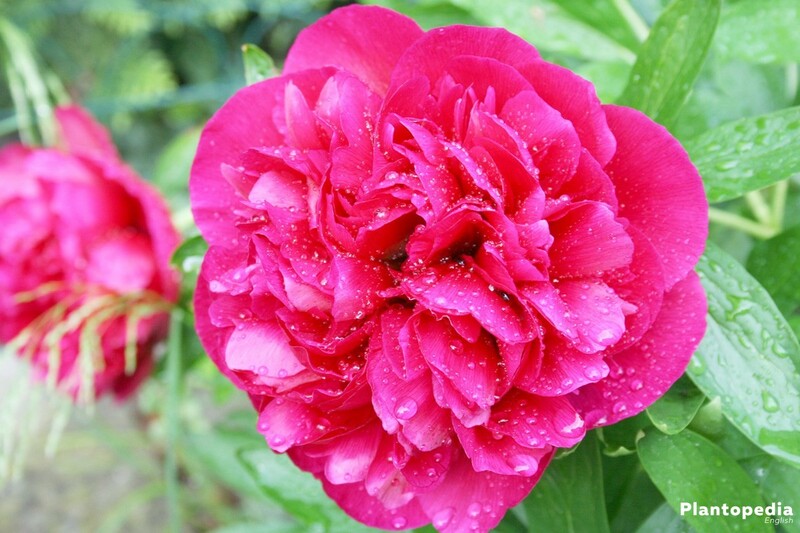 Gardeners are drawing romantic garden pictures with Peonies which will take care of floral moments of happiness. 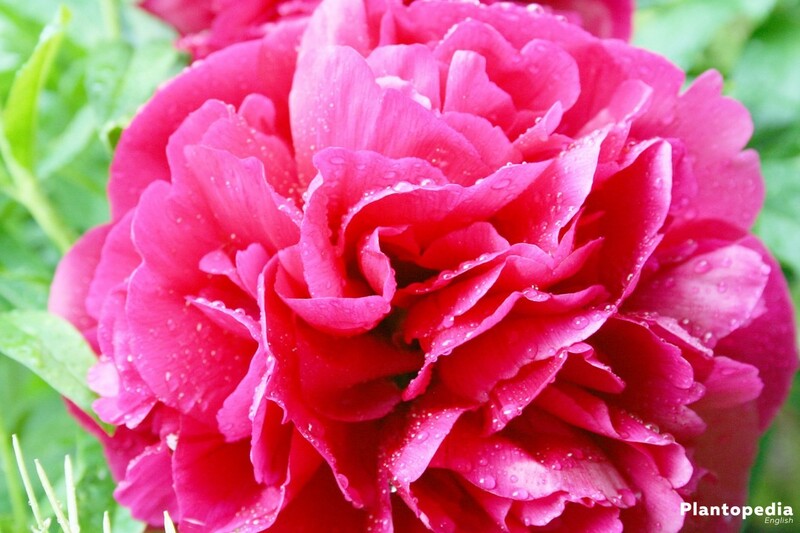 Fans of the beautiful farmers garden plants do not call it “Roses without thorns” while being in awe for nothing. Its lavishly enchanting blossoms are being emitted by the plants as shrubs or wooden shrubs. A seductive scent is announcing the impressive beauties from afar. In order to enjoy this floral revelation, a careful cultivation is imperative. 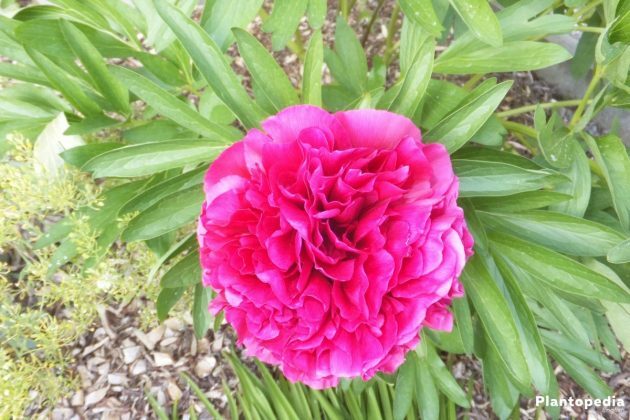 Inform yourself here with this detailed instruction how to ideally plant, care for it and cut the Paeonia. It is primarily the Paeonia officinalis and its hybrids, which have made a name for themselves for generations now as an ornamental plant. 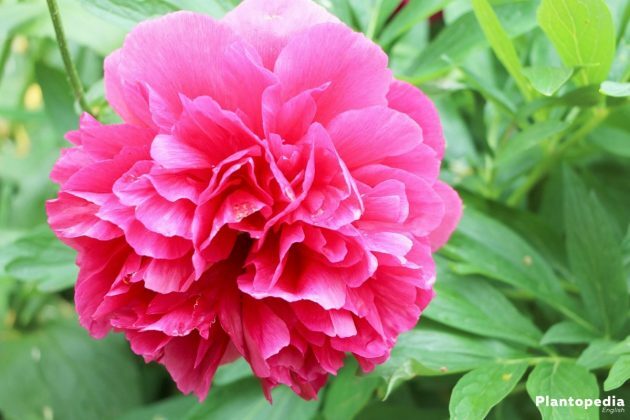 Furthermore we can thank the Chinese Peony (Paeonia lactiflora) for a multitude of breathtakingly beautiful varieties. The shrub Peony (Paeonia x suffruticosa) is rather rarely used in German gardens, as it merely thrives in winter mild regions. The proper planting takes a special position in its cultivation program, as Peonies root very deep and stay in their spot over several decades. 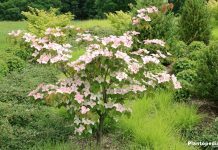 Shrubs generally lose their happiness to blossom between the first four and first five years of their life and thus have to be rejuvenated. 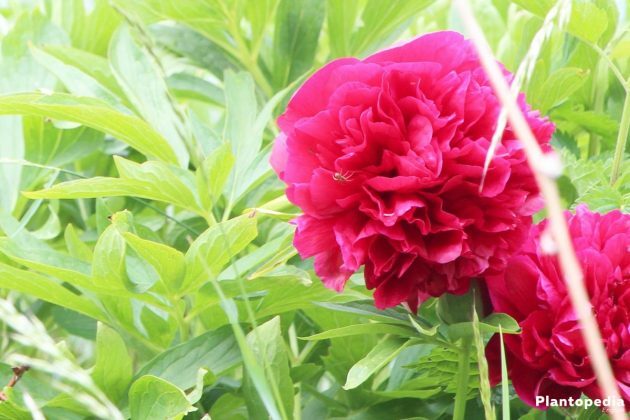 Opposing to this, Peonies win vitality and willingness to blossom each year it gains. If this process is being disturbed by replanting or multiplication, the plants react with a failure to blossom over several years or die off completely. Please pay attention to the following annotations regarding planting time, location selection or planting technique. If everything is being done as advised, the requirement for care will be reduced to a minimum. 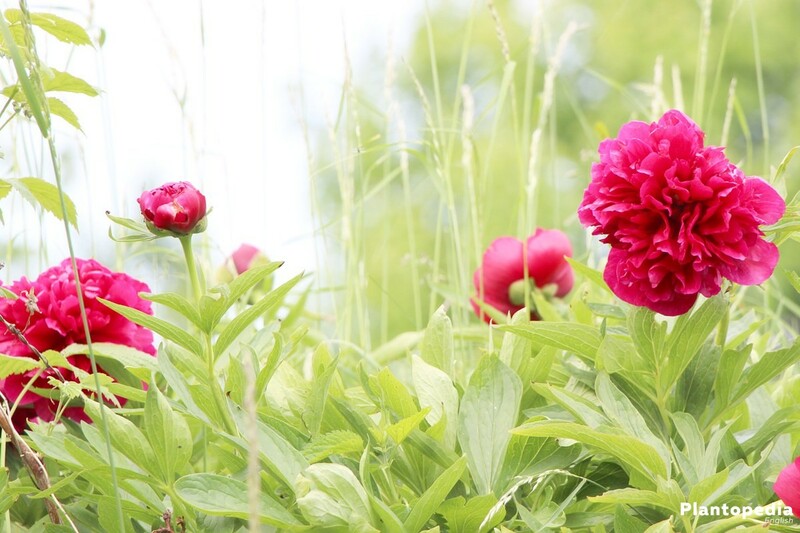 Peonies which have purchased in a container can be planted during the whole vegetation period. For these young plants, the window of opportunity opens in May, as soon as there are no more ground frost is to be expected. Disadvantageous in this aspect is the fact, that those are usually plant, that the roots are being placed inside the container and not raised in it. Opposing to this, you receive in autumn bare roots from a fresh harvest, which will establish itself on site and gift you the first blossoms within the first season. 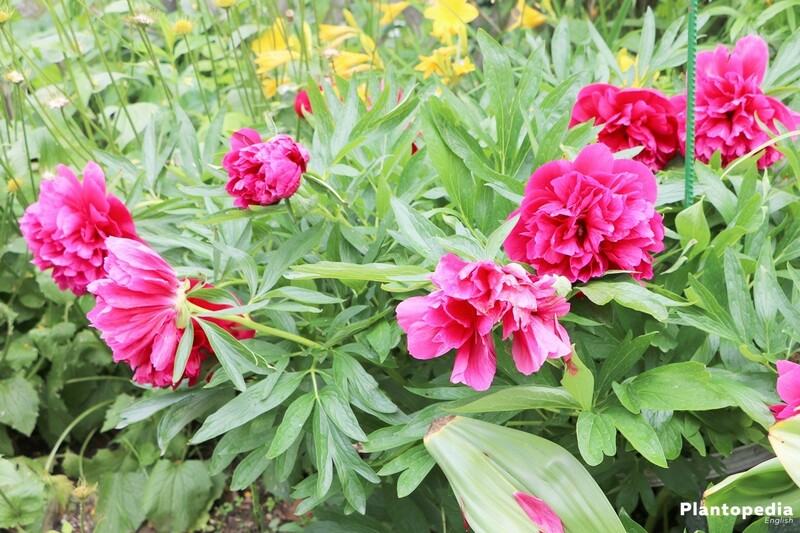 The ideal planting time for peonies is therefore autumn. 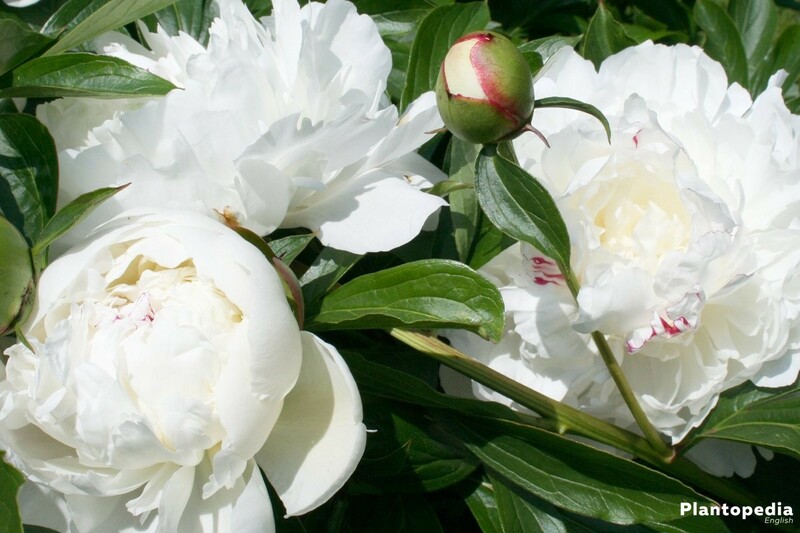 Choose for your Peonies a spot, on which no other Peonies have been placed in the last 10 years in order to prevent soil fatigue. 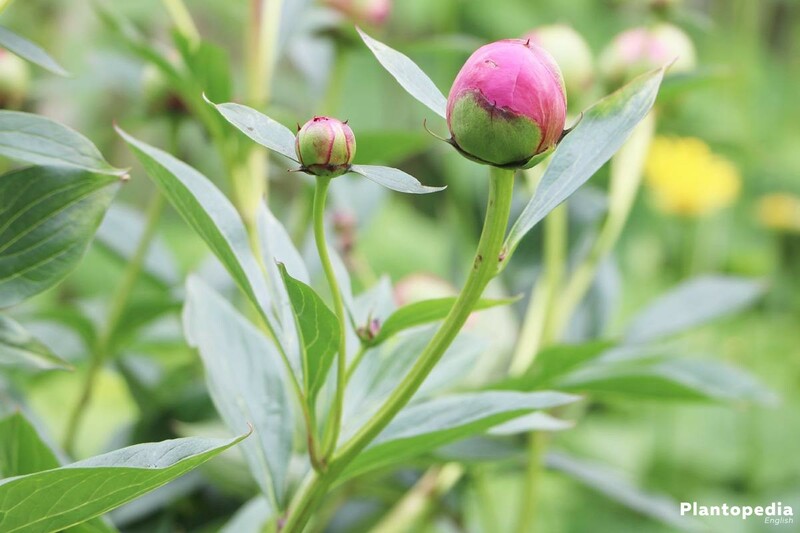 As deep rooters, the Paeonia leave root pieces in the ground, which carry a high potential of disease for the coming generation. 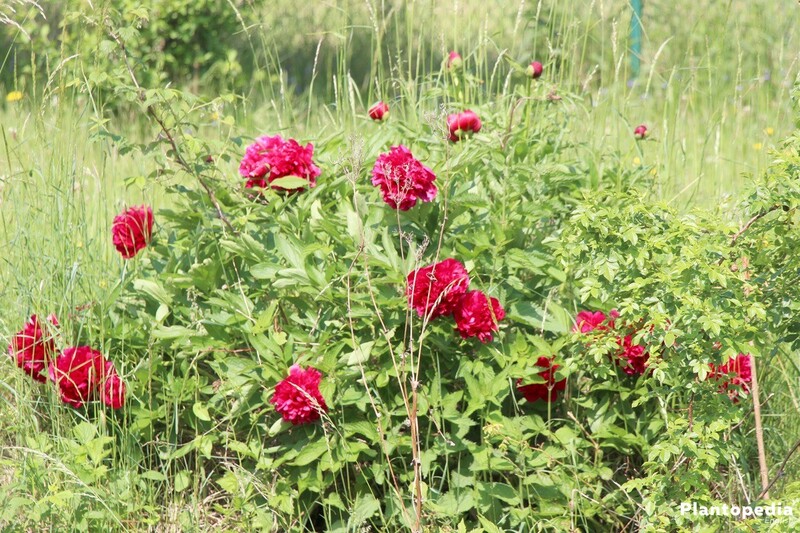 The freshly planted Peonies should also not be exposed to a high root pressure of adjacent woods. You should moreover not integrate them into a society with growing shrubs, as Peonies grow very slowly and could be overgrown quickly. Several of the most beautiful Peonies drive out early in the year. This carries for the delicate buds the danger of being damaged by frost. Please thus keep an eye out for a spot, which is not exposed to the morning sun in winter. 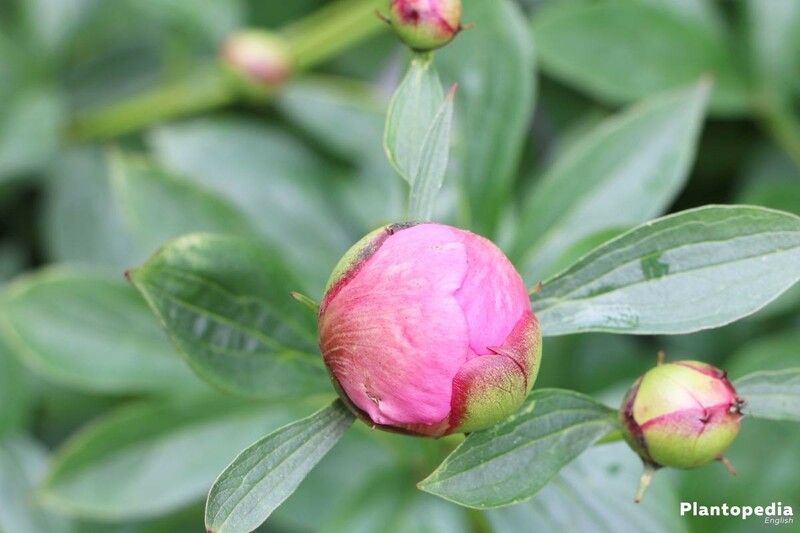 If frozen buds appear too quickly, the cell tissue can not keep up and tears open. The plant might not die from it, however it might cause the respective year’s harvest to fail. Before preparing the ground on the chosen location for the planting, place the respective yet potted in root naked young plants in a vessel with water. Dig the ground 2 spades deep and meticulously rake through it. Weeds, old roots and stones are carefully being removed. The finer the crumb structure, the faster the plants will root. If you are having doubts about permeability, add some sand into the ground. Meager ground is being optimized with ripe compost, bark humus or Guano granulate. Not suited for this purpose is a nitrogen rich barn or chicken manure. 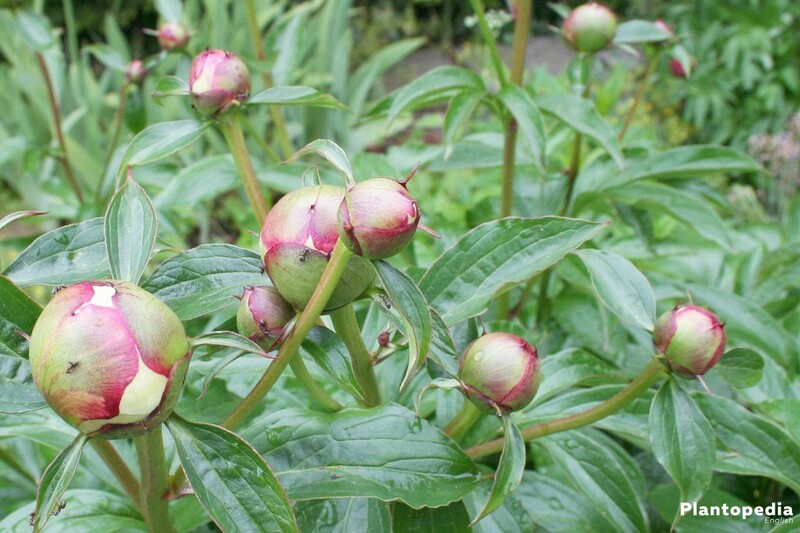 As soon as the preparation is finished and the young plants are well imbibed with water, the planting technique differentiates between shrub Peonies and bush Peonies. Both variants will be explained in the following. The most important pillar for a lavish blossom is, that the herbaceous Peony is not being placed too deep into the ground. The buds (eyes) still have to be placed below the ground surface. 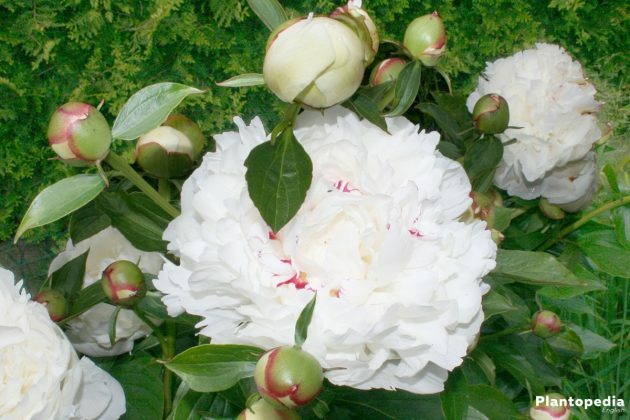 Arrange the shrub peonies in a group. Dig up planting holes with a distance of 80 to 100 cm so that the plant beauties can grow without obstacles. Low growing hybrids are okay with a distance of 60 to 80 centimeters. The young shoots can not be placed deeper than 50 cm into the ground. The sleeping eyes have to sense the sense to drive out. For this reason, a mulch layer is not being utilized. Wooden Peonies are mostly shrubs refined by multiplication. 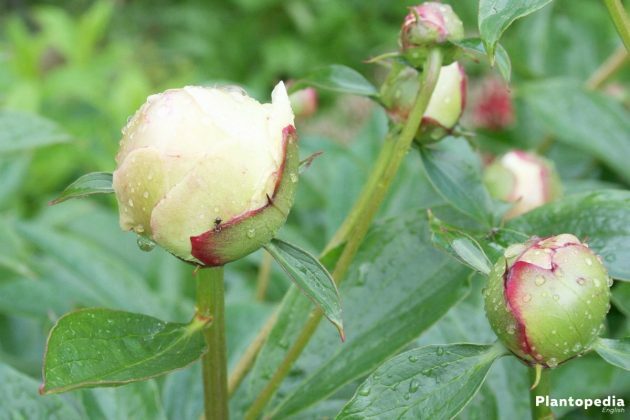 The master gardener grafts refined rice on the root of a robust wild variety, like the Peony lactiflora or Paeonia officinalis. 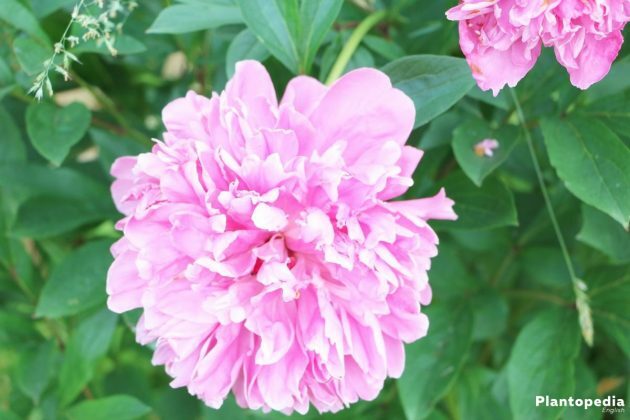 While it might prove fatal for shrubs to plant them too deep into the ground, it is the other way around with shrub Peonies. It is the goal, to offer the possibility to refined hybrids, to release themselves from the wild underlay in order to create their own root system. This plan only succeeds, if parts of the refined species are being placed below the earth surface. 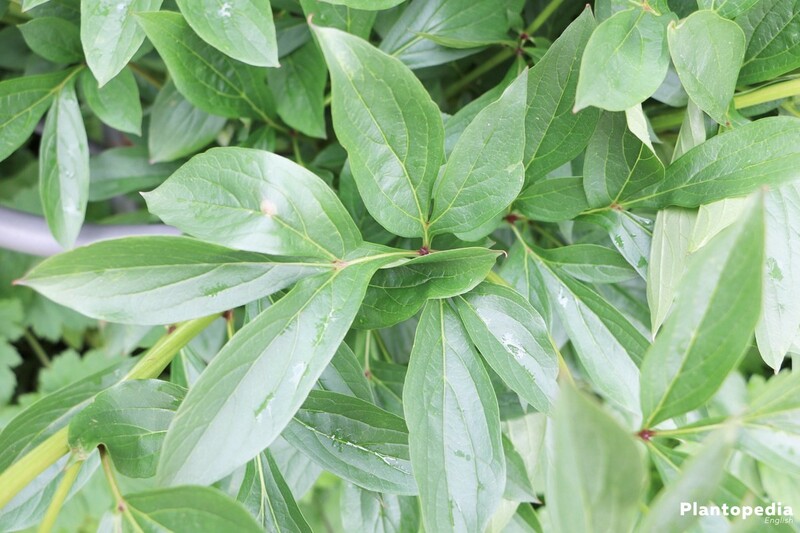 Competent tree nurseries are marking the spot with a label, up until the Peony has to be planted inside the ground. This label should under no circumstances stay on the plant as it could grow inside the bark. 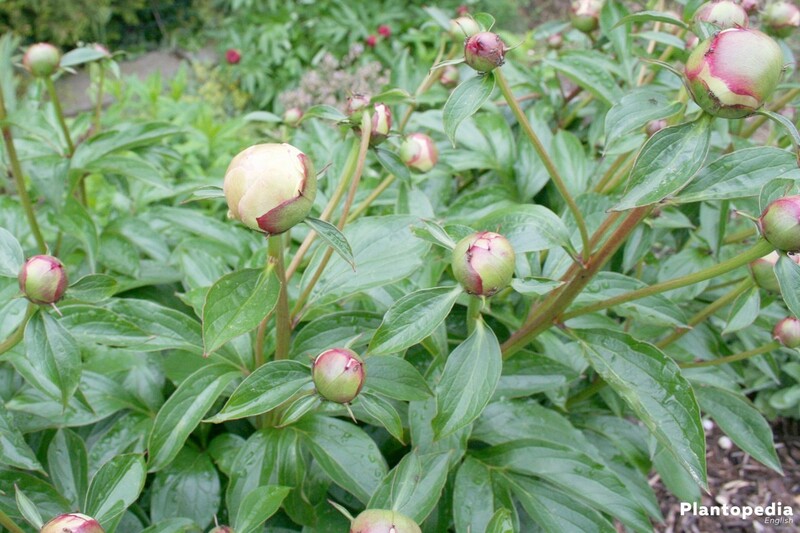 Compared to the planting, the herbaceous and wooden Peonies are conform regarding care. The following annotations are valid for both growth equally. 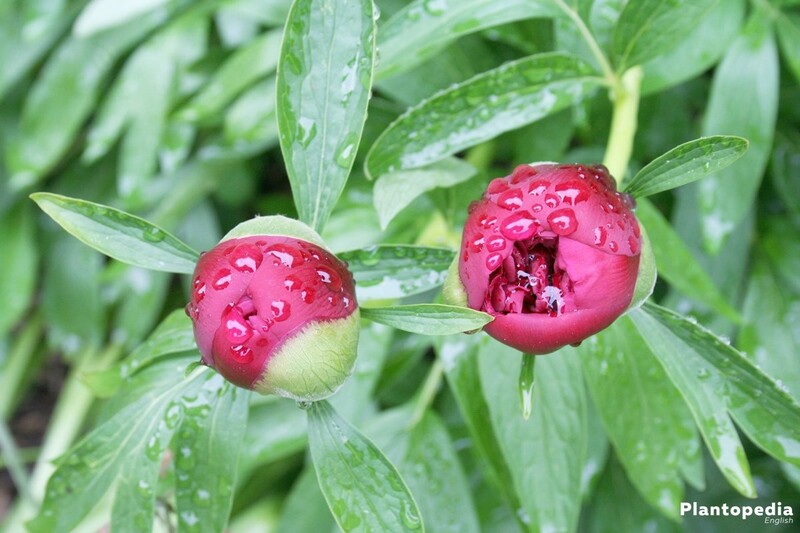 As long as the Peony is inside the state of rooting, there is a need to water. As a deep rooter, the plants will have grown as deep into the earth after 3 to 4 years, that they supply themselves with water. You should thus water the freshly planted Peonies in the first years during dryness. Test with your finger, whether the upper 2 cm of the earth are dried. If this is the case, please administer the water directly on the root disc, without causing water logging. During the time of bud growth, the water needs are especially high. 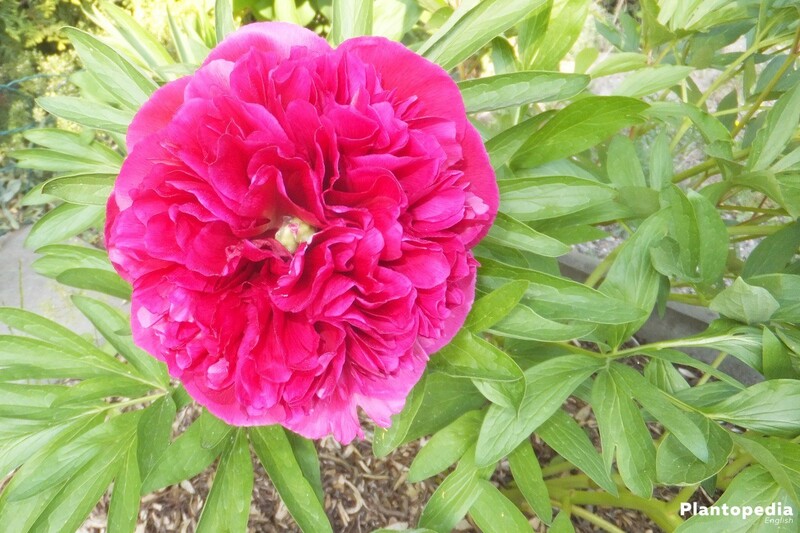 With a focus on the slow growth, Peonies are proving to require low levels of energy. A strengthened dosage of fertilizer is in no way carrying positive effects on the speed of growth. On the contrary, nitrogen rich full fertilizer launches diseases, like the fungal infection Boytrytis. The plants nevertheless a low dosage of nutrients. 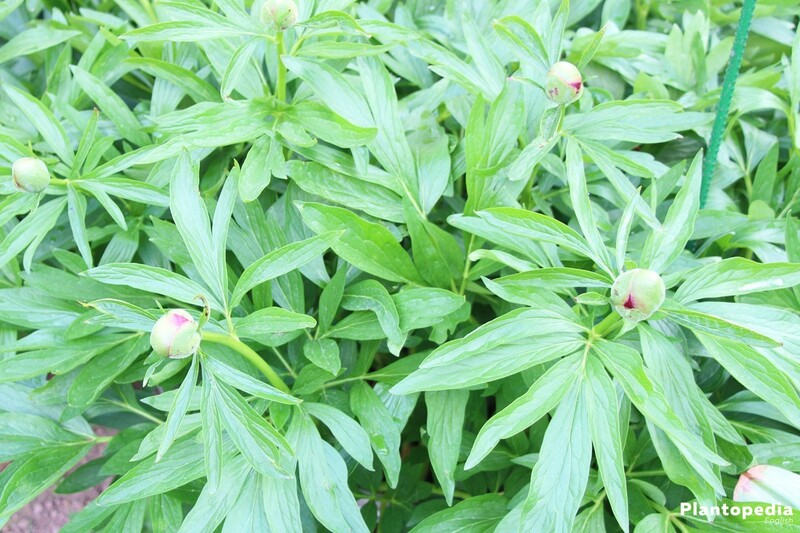 If you use blooming shoots more often than cut flowers, the Peony will increasingly loose nutrients. In this case we recommend a monthly dose of organic fertilizer, like compost or horn shavings. Please clean withered blossoms in a manner that the blossom leafs can not fall to the ground. Thanks to this carefulness, the Peony will be saved from the strength robbing growth of the mighty bellow fruit. 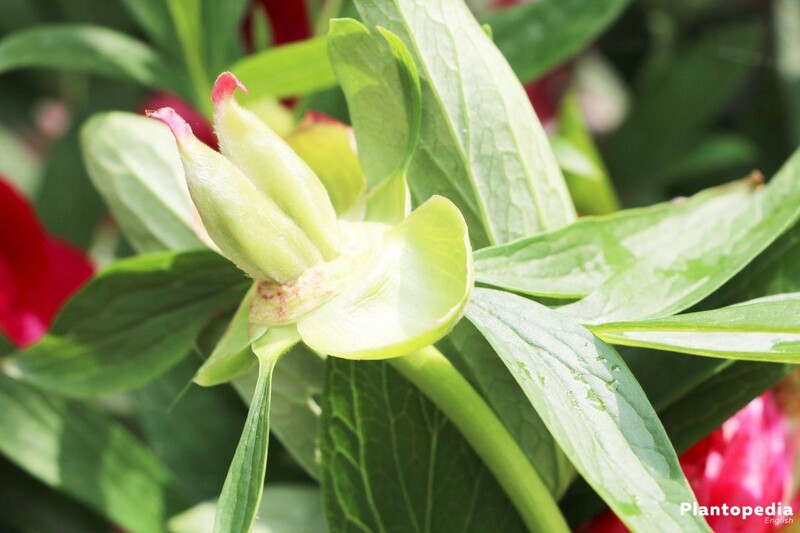 Instead, the plant invests its energy in the grow of new blossoms. Cut the worn out blossoms slightly above the. 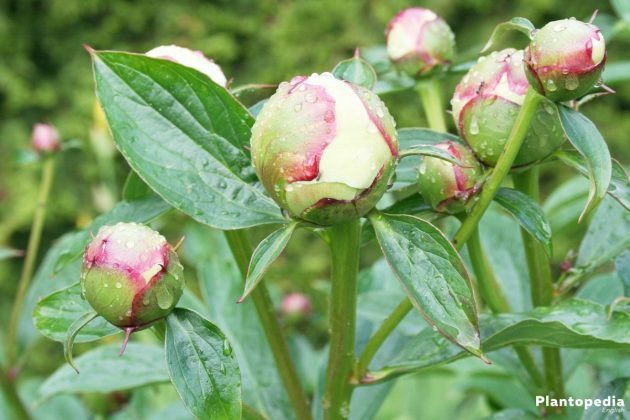 But make it a target, that the Peonies will multiply via self-seeding in the garden and leave some blossoms standing at the end of the flowering period. 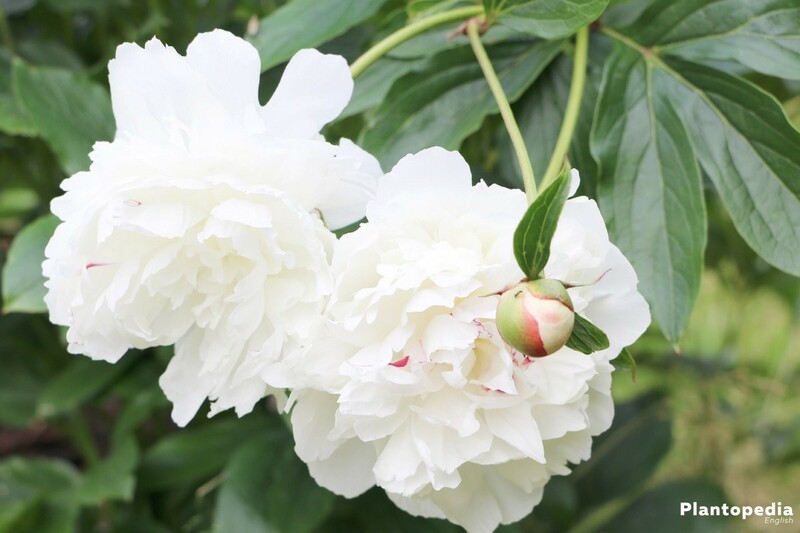 With increasing age, the Peonies win frost resistance, so that adult specimen can tolerate – 20 degrees Celsius with no problems. In the year of the planting as well the next two years, cover the planting spot with pin brushwood or foliage, so that the young root bales will not freeze. If meteorologists are announcing night frost, wrap the shoots and branches with a breathing active fleece, to protect the young buds. 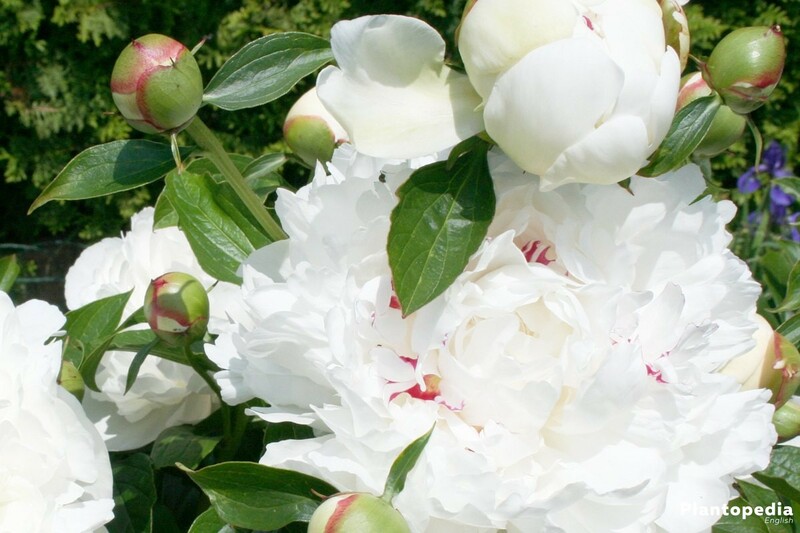 The branches of shrub peonies can break in under the burden of snow. Bind therefore before the winter the shoots to a loose crest and additionally shake the white hood if required. While shrubs and bushes work together concerning water and nutrients as well as hibernation, this is not the truth for the back cut. The following annotations explain the differences. 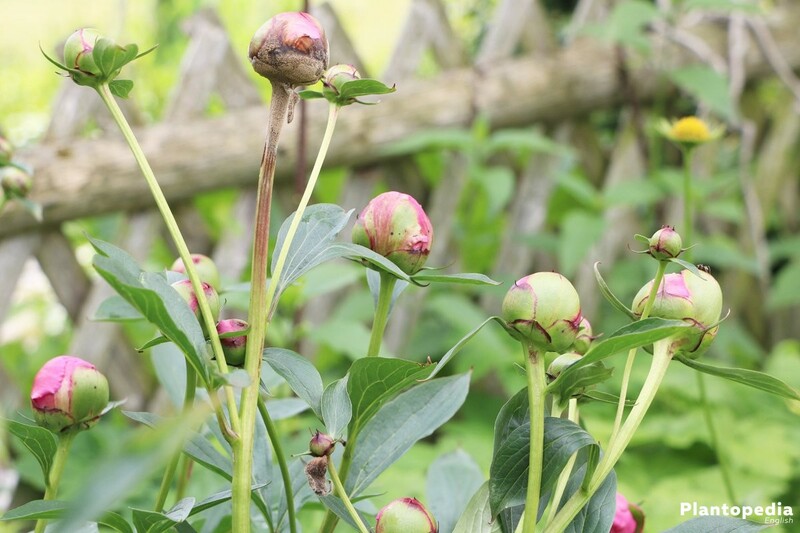 Peonies are thanking its remarkable longevity not least to the circumstance that they retreat over winter fully into their root bale. They upper surface planting parts are slowly pulling in during autumn season, which is being indicated by the yellow to brown coloring. Await this process until October/November, as during this time valuable nutrients are being stored from the leafs and shoots into the roots. Cut all shoots onto slightly above ground level subsequently. Please to not dispose of the waste material on the compost, as diseases could spread in the garden by doing so. 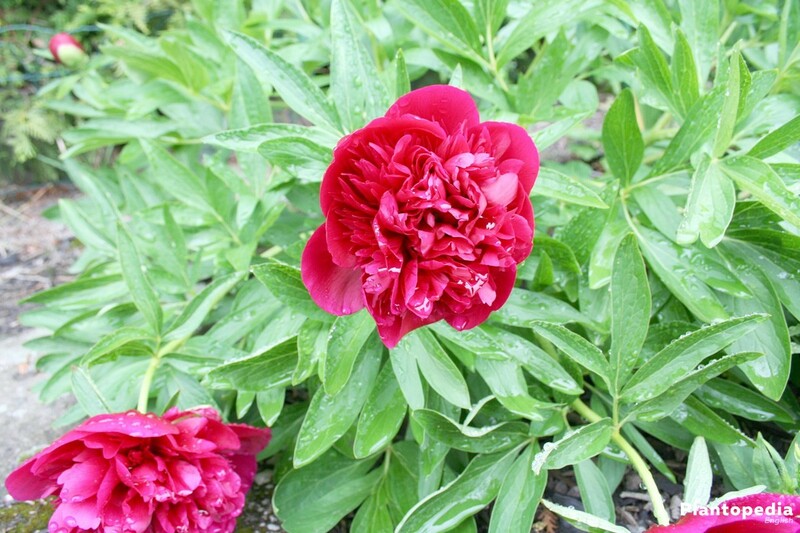 If a Peonies thrive as a bush, it grows this year’s plant already for the next season. For this reason, cut the plant with extra carefulness. In winter sensitive locations, the branches can, in the worst case, vastly freeze back. Please await in this case the commencement of the growth period. Between the end of March and the middle of April you will be able to see, which part of the shoot has not frozen, to merely cut the dead piece. 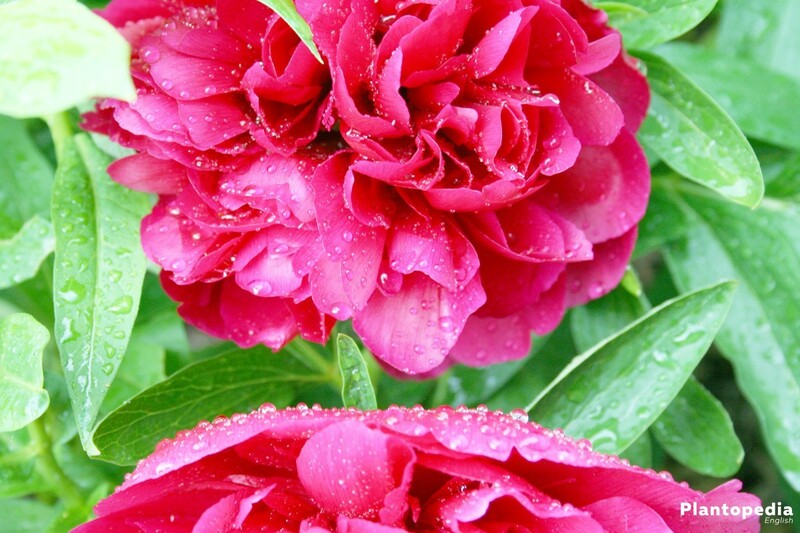 Peonies are vastly being spared from snails, lice or other animal parasites. This is, unfortunately, not the case for diseases. 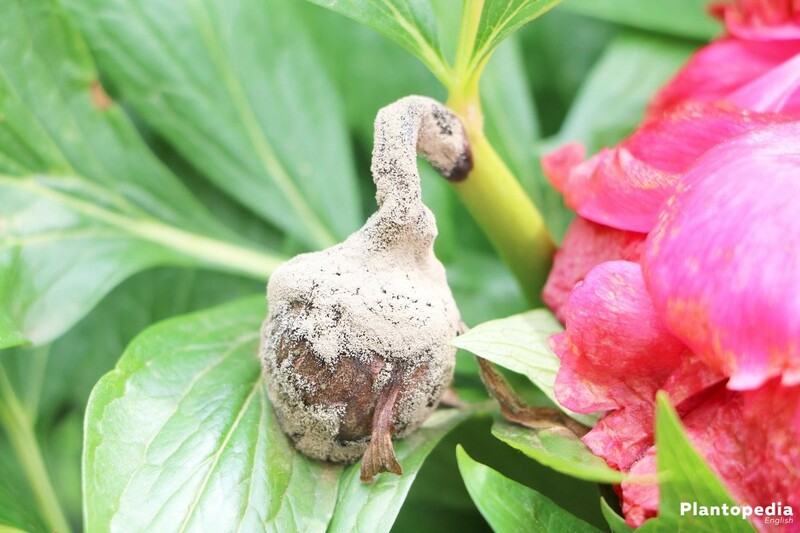 There is an explicit subspecies of the sac fungus species Botrytis, which is specialized on the Peony. These viruses are infesting shoots and buds in spring, only to march into the inside of the plant from there. 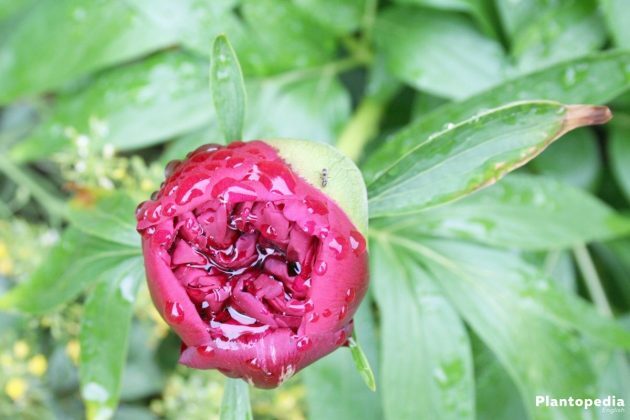 Here, fungal spores clog the pathways, so that the affected Peony dries out despite a sufficient water supply. Withered buds and blossoms as well as brown leafs covered with gray mold are indicating the disease. Effective remedies against the Peony disease are not yet available. But there is hope. As the root stock is normally not infected, a radical back cut up onto the healthy wood can yet safe the plant. 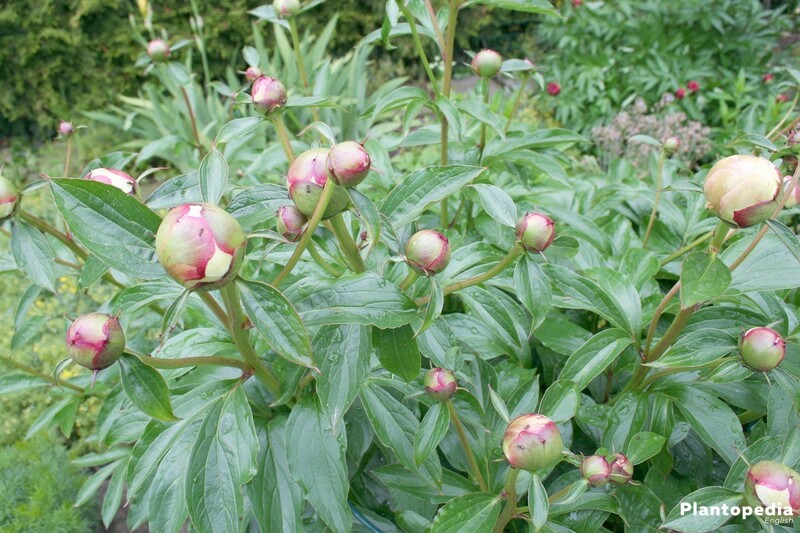 With dry conditions there are good chances that the Peony will drive out again healthily. Only this year’s harvest will fail to occur. A sunny, airy location has a preventative effect. 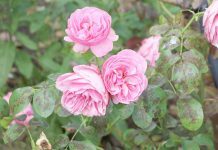 Further should the foliage be removed from the plant and the ground without any traces in autumn. The covering of the ground as winter protection should only occur if there is an actual need and be removed in spring. Spraying with Oscorna fungal prevention in autumn and late winter have proven to be effective prevention against Botrytis.